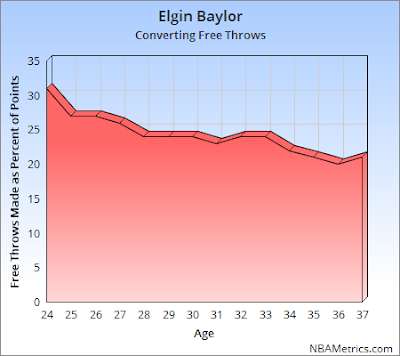 During his first five NBA campaigns Elgin Baylor made a living getting to the free throw line and converting from the charity stripe. Minutes, knee injuries and 100+ games of college ball slowly wore down the Lakers superstar. As Baylor's speed and leaping ability declined those easy baskets were harder to come by.